Maryland Democratic gubernatorial nominee Ben Jealous today showed that he is engaged in a full-on war with the news media. Democratic gubernatorial nominee Ben Jealous has vetoed a western Maryland newspaper’s statehouse reporter as a panelist for his sole debate with Republican Gov. Larry Hogan. Jealous exercised his right under his campaign’s agreement with Hogan’s to strike Tamela Baker of The Herald-Mail of Hagerstown from the panel, Maryland Public Television confirmed Tuesday. As a result, The Baltimore Sun said it was reconsidering its participation in the questioning. Monday’s debate, sponsored by MPT, is the only one the two campaigns agreed upon before the Nov. 6 election. Kevin Harris, senior adviser to Jealous, declined to talk about why the campaign excluded Baker or whether it had any complaints about her coverage. He instead issued a statement. Two attacks against the free press in 24 hours. Nobody ever taught Ben Jealous how to win friends and influence people. The Jealous attack launched at Len Lazarick and Maryland Reporter is even more patently absurd. There are few, if any, media outlets that are as even-handed and Maryland Reporter, providing all sides with an opportunity to have their voice heard. That Jealous thinks it’s a “right-wing blog” shows a stunning lack of familiarity with Len Lazarick, with Maryland Reporter, and reinforces the notion that Jealous is an interloper in Maryland who doesn’t know anybody and doesn’t know anything about state politics or state government. What’s even more absurd is what Jealous thinks is a legitimate news outlet. Jealous is a huge fan of The Real News Network who, as we have noted before, is a radical left-wing “news” organization that does not release its sources of funding, consists of radicalized political activists masquerading as “journalists”, is sympathetic toward American traitors like Edward Snowden and Chelsea Manning, and has ties to the dictatorship in Venezuela. The fact that the Real News is acting like a de facto arm of the Jealous campaign probably helps ender them to Jealous, who certainly would prefer that they be part of the debate panel. And that, ultimately, is a chilling sign as to what a Ben Jealous administration would be. If elected, Jealous would be hostile to any media organization that did not kiss the ring and provide only glowing coverage about Jealous. Any organization or any reporter that did not provide the coverage of Jealous that he and his minions thought he deserved would be ostracized, demonized, and minimized in the Annapolis press corps. In effect, Jealous would be doing the exact same thing that he and his supporters accuse President Trump of doing. 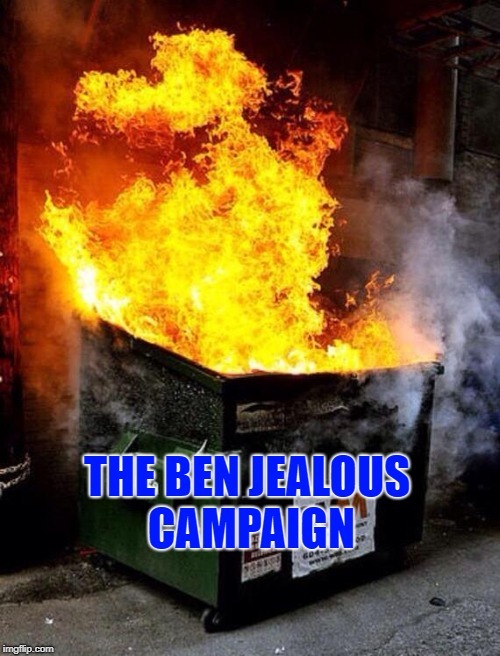 While it is understandable that Jealous is lashing out at anybody and anything as his campaign continues to fall deeper into the abyss, it is good to see that all people, left and right, media and non-media, quickly criticized Jealous and his campaign for his boneheaded attempts to control the media and his attempts to intimidate the media into providing only positive press coverage. If Jealous wants to live in a society where leaders get media coverage that is consistent fawning over them, he can move to a country like Venezuela where they don’t have media watchdogs, an independent press, or freedom. What’s crystal clear from the last 24 hours though is this; Ben Jealous is an enemy of free speech and an enemy of a free press.